In a previous post we spoke about curious innovations made by Johann Baptist Beha, which never made it "main stream"...resulting in unique and unusual clocks left for us today. 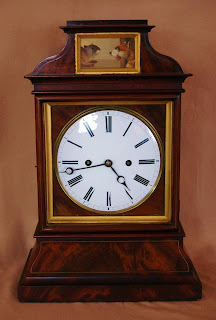 This next post I would like to share a clock, and an innovation that did make it main stream. This piece is a very early, and special shelf clock with automation made by Johann Baptist Beha in 1849. First off we would like to thank Dr. Wilhelm Schneider of Germany for his assistance in researching this piece. Dr. Schneider ,besides being the authority on the Beha factory… is also a accomplished author and a good friend. The case on this piece was made by Peter Wehrle a case maker in Dittishausen. Peter Wehrle apprenticed in Vienna…building cases for fine Vienna Regulators. This explains why this case is very refined compared with many Black Forest clocks made during the period. It also closely resembles a fine Viennese shelf clock. The case is made from the finest veneers and brass inlay… the proportions also show Peter Wehrle had a well trained eye. Peter Wehrle’s early relationship helped Johann Baptist Beha secure his name and reputation as a quality BF clock maker. The backboard on this case is hinged at the bottom, and has a locking mechanism at the top of the back board. This was done by Peter Wehrle prior to 1854. 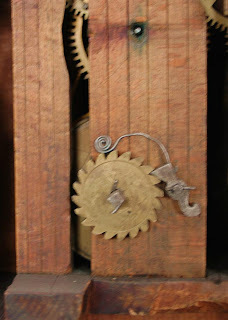 The movement on this clock is an early wood plate, 8 day. double fusee movement…if you look at the stop wheel on the back of the movement (see pic)… it is a very crudely made and primitive… This movement predated Johann Baptist Behas integration of the fusee and cuckoo (One of Behas greatest innovations)… and a movement that would become the staple in his quality clocks in later years. In the Beha books, Johann Baptist Beha talks about experimenting with the 8 day fusee movement…but first incorporating blinking eyes. This is one of those pieces. .. a Beha, without a cuckoo. Shortly after the success Beha had on this piece, the cuckoo was added and the fusee cuckoo was born. Above the dial in a small gilt frame, behind glass is a small 1.75 X 3.25 painting on zinc. 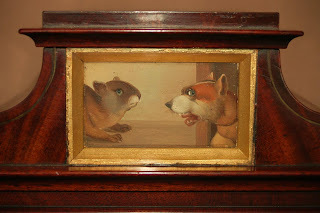 In the painting a dog has cornered a rodent. The eye on both animals (no larger than the end of a pin head needle) move back and forth with the pendulum. Rarely did the Beha factory ever mark their clocks, and to find a Beha factory label is considered unique. 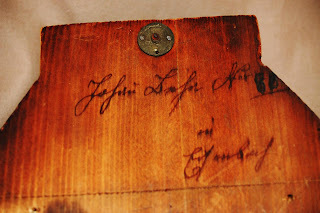 The last detail on this piece that makes the package so sweet… is a clear signature “Johann Beha in Eisenbach” done by his own hand. Since this clock was made within the first few years of Johann Baptist Beha's clock making career, and the importance this piece played in the Behas early development of the 8 day fusee movement it is a very special clock in our collection. Also because of the documentation by Johann Baptist in the books regarding this piece being one of the first, and the Signature... it is safe to say that this clock was made not only by the Beha factory, but by the hand of Johann Baptist Beha himself. We are very excited to be able to share this important piece of Beha history.